Preheat oven to 300. Line an 8×8 inch pan w. foil and grease w. butter. In a medium bowl, whisk together flour, soda, and salt (if using unsalted butter.) W. an electric mixer, cream butter and sugar. Add eggs and vanilla, beat until light and fluffy. Add flour mixture, blend on low until just combined, don’t overmix. Gently fold in choc chips and pecans w. a spoon. Put in pan. With damp hands, press down until flat across the top. Cook for 35-40 mins, until toothpick comes out clean but still soft in the middle. [I cooked mine for 33 mins, toothpick wasn’t exactly clean, but I like them gooey.] Wait until cool to cut. 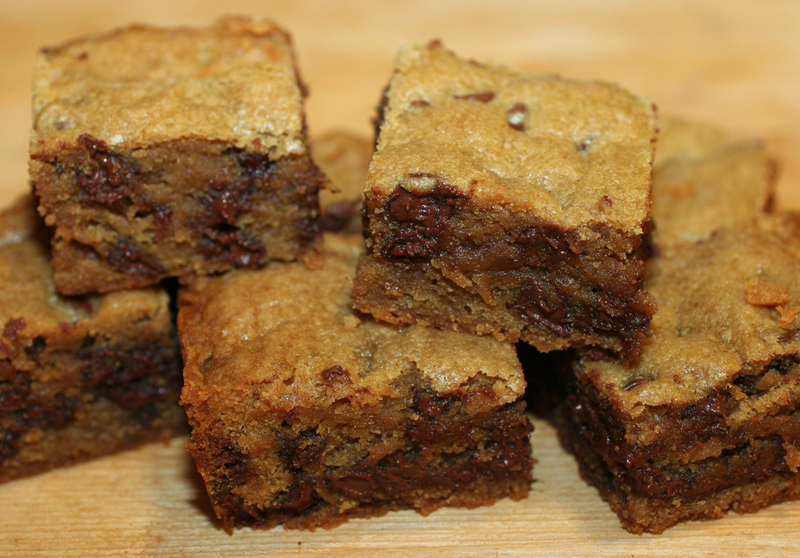 Another thing, blondies usually dry out more quickly than say brownies or cookies- so the fresher the better.